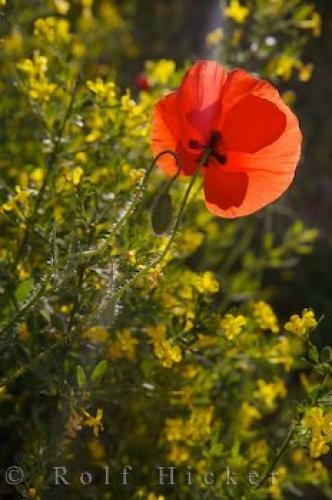 A lonely poppy in front of the yellow wildflowers shows the simple beauty of a single bloom as it grows across the landscape in the village of Moustiers Ste Marie in Alpes de Haute in Provence, France. The lonely poppy with the yellow wildflowers in the background is a little misleading as it is very unlikely that one single poppy flower grows. Usually, there are more poppies dotting the terraces of the olive groves in the village of Moustiers Ste Marie in the Alpes de Haute in Provence, France.Wildflowers and poppies amongst terraces of Olive trees in the village of Moustiers Ste Marie, Alpes de Haute, Provence, France, Europe. the Alpes de Haute in Provence, France.